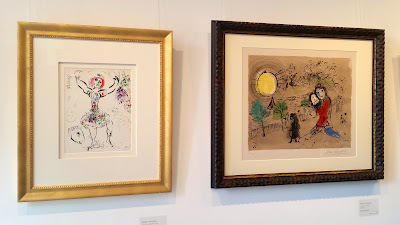 Handmade in Israel: Marc Chagall "My Life"
One recent Friday morning I hopped over to Tel Aviv with friends to see the exhibition Marc Chagall "My Life". 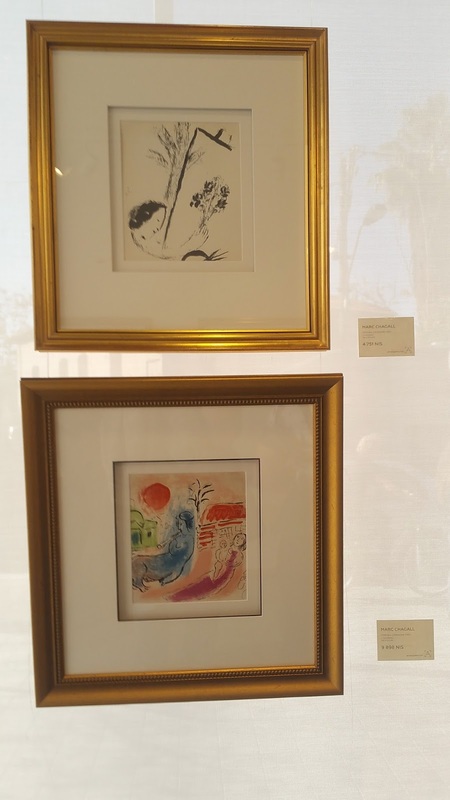 It was held in a tiny private gallery on Rothschild Boulevard, one of the principal streets in the centre of Tel Aviv and also one of the "coolest". The exhibition was so small that, frankly, we weren't there for very long, but what we saw was a real treat! 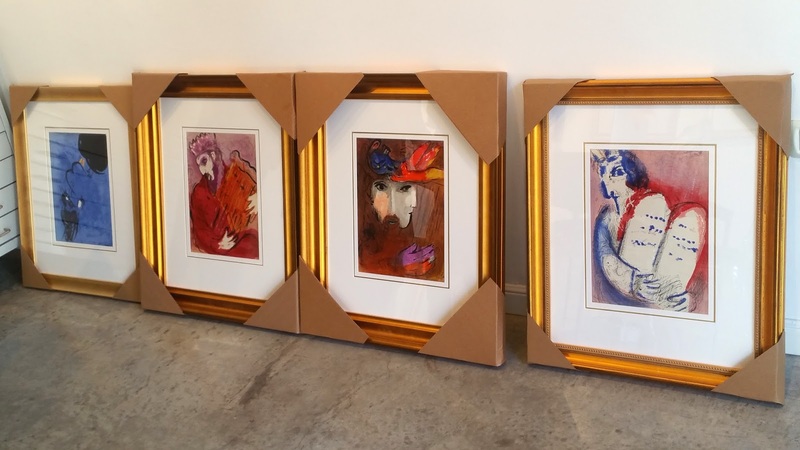 Altmans Gallery specializes in lithographs and engravings, as well as works of contemporary Russian painters and graphic artists, ceramics, porcelain and sculpture. 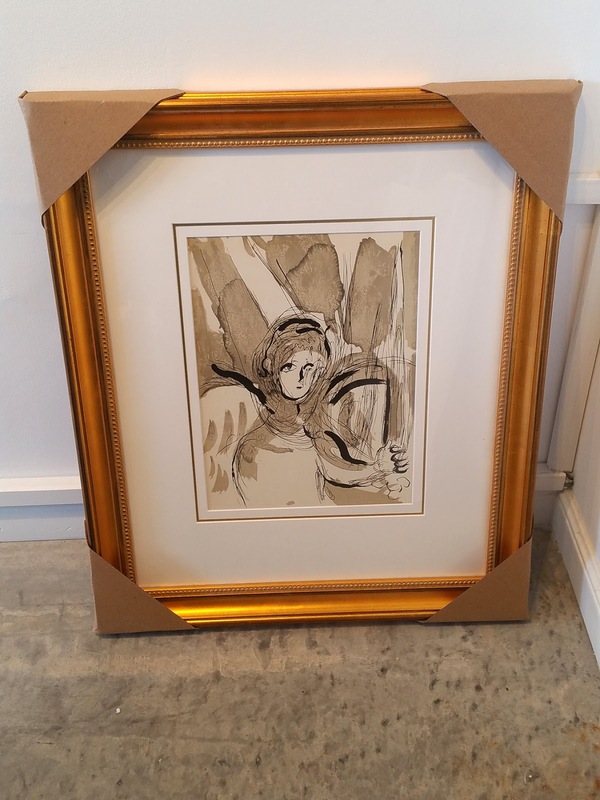 Lithography, from the ancient Greek lithos, meaning "stone", was invented in Germany in the 18th century. It is a method of printing from a stone or metal plate onto paper or other suitable material. 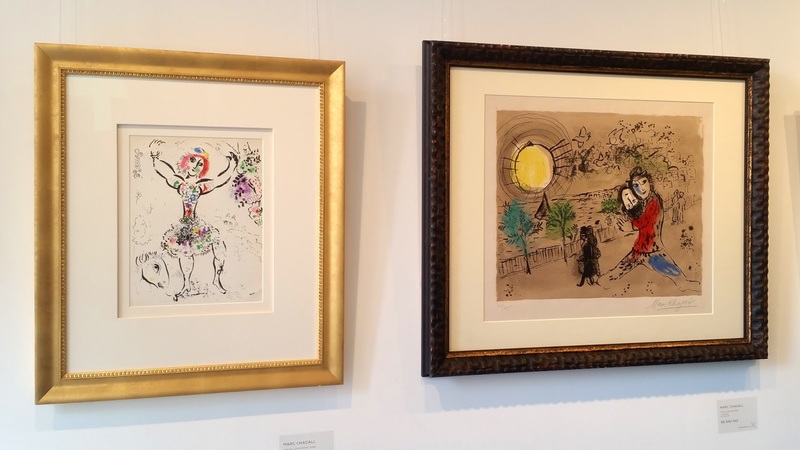 Marc Chagall (1887-1985), once dubbed "the quintessential Jewish artist of the 20th Century," was a Russian-born artist who worked in just about every artistic medium, including fine prints, etchings and the lithographs which were celebrated in this exhibition. 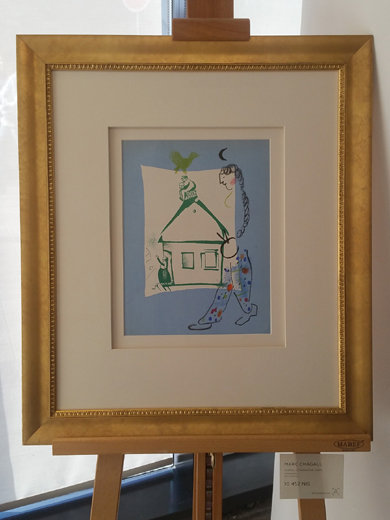 He discovered lithography for himself in the late 1940s, in the workshop of the New York graphic artist Albert Kermen. One of his first experiments with lithography was a series of 13 lithographs based on four stories from The Arabian Nights. 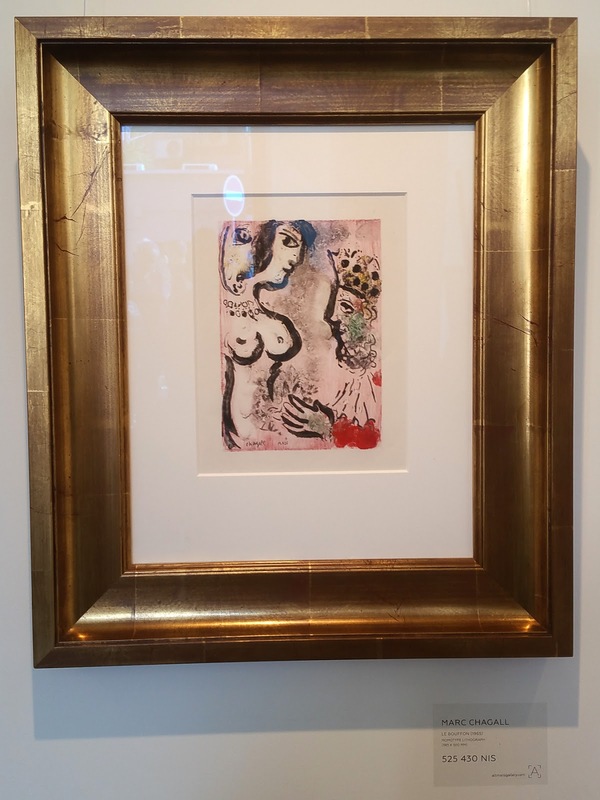 Chagall's lithographs often centre on the topic of emigration as he escaped Russia to flee antisemitism, went to Europe and then escaped Nazi persecution by going to New York. Other recurrent themes are illustrations of village life in his native Russia - images of a red cow, an angel, fiddler on the roof and birds - and scenes of Paris, his beloved adopted city. 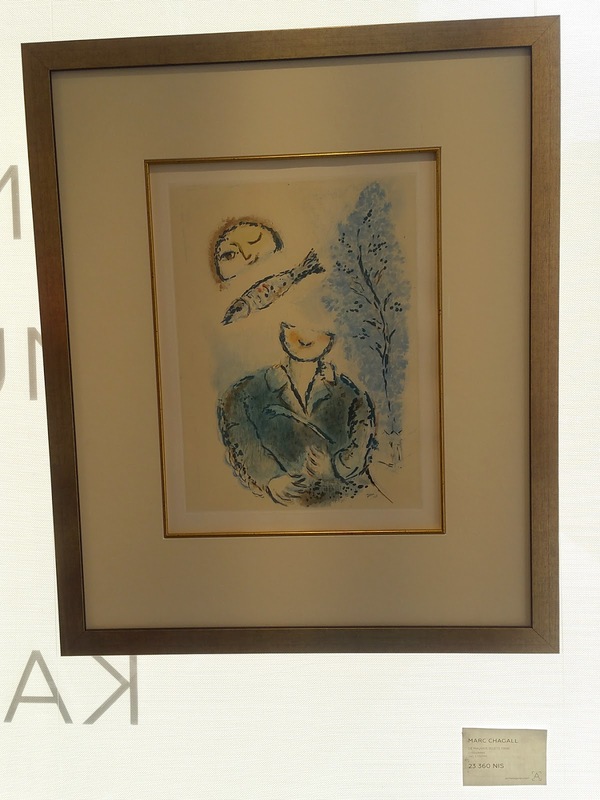 Chagall was raised in a Hasidic family and studied Hebrew and the Tanakh (Hebrew Bible) as a young boy. Many of the motifs in his art were inspired by these teachings. He also travelled to Jerusalem in 1931 to discover and experience the Holy Land. He later painted 12 windows that were installed in the synagogue of the Hadassah Medical Centre in Ein Kerem, Jerusalem. Each of the twelve windows represents one of the Tribes of Israel. 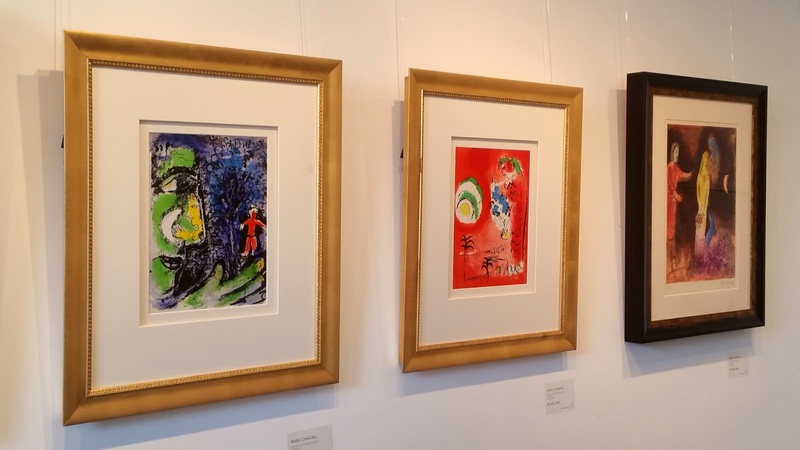 The exhibition, which was timed to mark 130 years since Chagall's birth, presented more than 20 black and white and coloured lithographs, privately owned by the gallery. 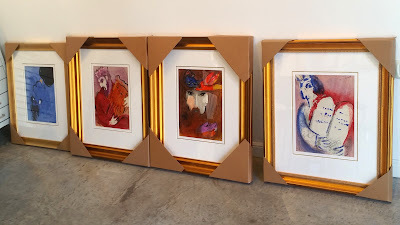 These included rare prints such as "The Yellow Sun" (1968), "Chloe Dressed and Capped by Cleariste" (1961), as well as a unique signed monotype "Le Bouffon" (1965). Some of the lithographs had never been exhibited in Israel before and some were being shown together for the first time within the framework of one exhibition. 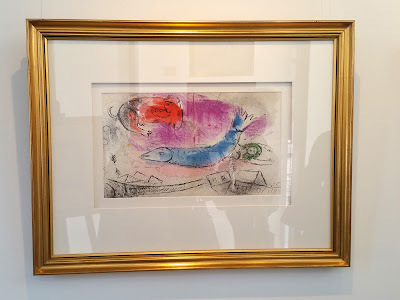 We saw Chagall's prints from his famous Biblical series, as well as works dedicated to Paris, his beloved adopted city, Vitebsk, his hometown, and childhood memories of the artist. 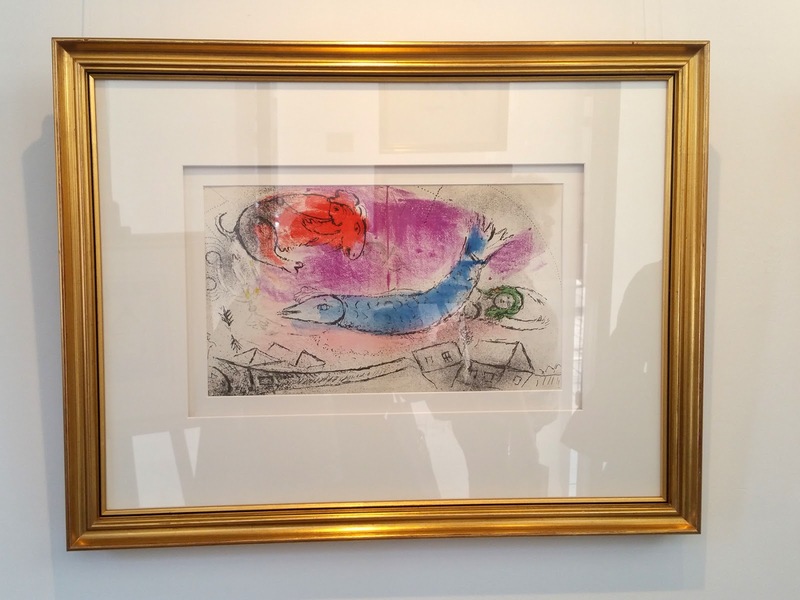 Chagall's Biblical series is considered to be one of the most important stages of his work. According to his own recollections, this theme attracted him in his first years in Paris, but the trip to Palestine, Syria and Egypt in 1931 served as a basis for deeper understanding of the subject. 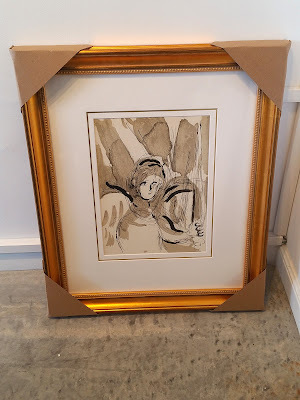 On his return he made 105 etching sheets, then picked up the theme once again twenty five years later, in 1952-56, with the series titled Drawings for the Bible. This series comprised of 24 colour lithographs illustrating tales from the Bible and was published by Verve, Paris and printed by Mourlot, Paris from 1958-1960. 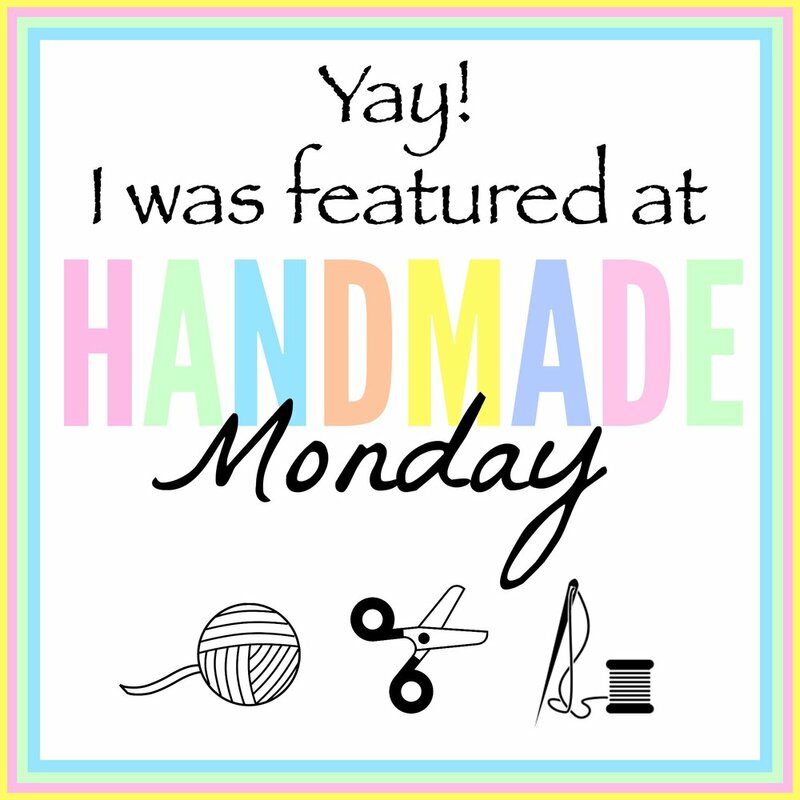 * This post has been shared on Our World Tuesday, Wednesday around the World, Wow Us Wednesdays, Wonderful Wednesday Blog Hop, The Happy Now Blog Link -Up, Little Things Thursday, Share Your Cup Thursday and Sunday Snap. His work is wonderful! Thought provoking and colorful. 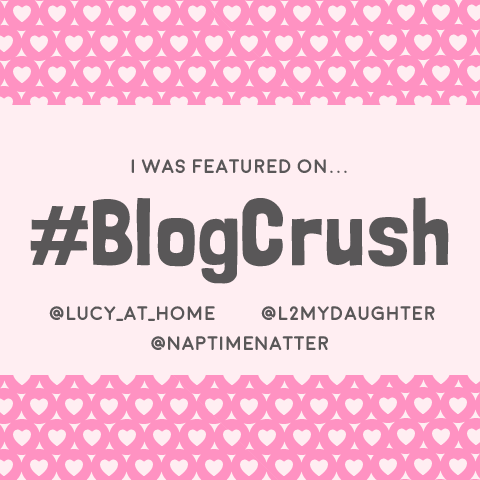 What a beautiful blog!Love your cards!Hugs! I love March Chagall and his art. I'm most familiar with the window series you discussed as I have visited several temples with copies of the windows. I also love the works he made on his courtship and marriage after his wife's death. I originally was intrigued by the floating lady and and had to read to understand the work. Love this post! About your comment: Yes, you know to visit Galilee is on my bucket list! Wow. I found this post absolutely fascinating. I haven't had much experience with Chagall's work, and certainly didn't know these details of his long and productive life. Thank you so much for sharing your knowledge as well as your photos. That is really cool! Recently we went to a church here in Germany where all the stained glasses were made by him. Absolutely beautiful! What a wonderful display! Thanks for sharing with SYC. I enjoyed the little tour of Chagall's work. The collection may be small but I bet it's worth a small fortune!